Just last week I blogged on the rise of the virtual office and the importance of apps to enable the workforce to have the same productivity tools while on-the-go that they’d have access to from the desktop. I hadn’t planned to write on mobility again so soon, but, having just read Matt Hamblen’s article at Computerworld, “Chief mobile officer: A job title now timely?” it seems equally timely to continue the discussion. 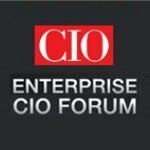 Enterprise CIO Forum enterprise CIO forum. permalink.